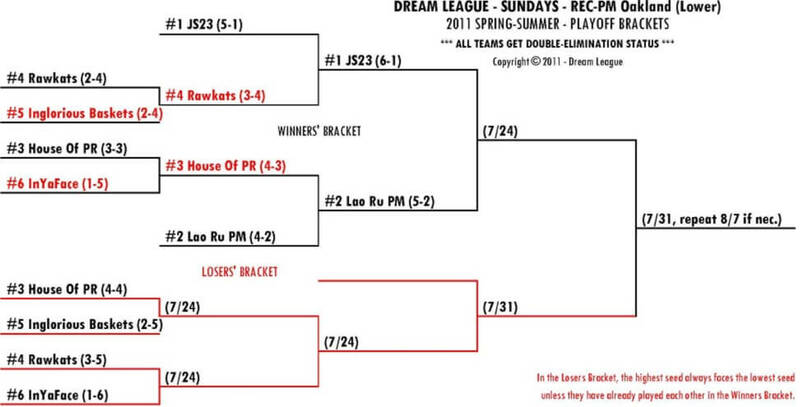 THU 7/21 (4:30PM) — In the REC-PM (Lower), which means no players from a higher division, we have a 6-team bracket. Below is the six-team playoff bracket for REC-PM (Lower). This Sun 7/24 is a pivotal day, as there will only be one team left standing from the Winners Bracket and the Losers Bracket will dwindle from four to one in a mini-final-four showdown. Please note, I have matched up #3 vs #5 and #4 vs #6 instead of the traditional high vs low #3 vs #6 and #4 vs #5 in this upcoming round. Why? Well, because those matchups have already been played. You’re either gonna go with one philosophy or the other, and my philosophy is that it’s just that much harder to beat a team twice in a row. So mix it up a bit. And besides, it’s double-elimination. It’s not one-and-done in a vacuum. You’ll progress through the bracket if you can beat a diversity of teams.